The statistics about widespread lack of physical activity are shocking. So are the consequences. We humans need exercise, and if we don't get enough of it, all hell breaks loose. Here's how to help kids become more active! If you're even the least bit interested in physical fitness—and I'm going to assume you are because you're at Bodybuilding.com—then the following statistic should blow you away: According to the World Health Organization, physical inactivity is the fourth leading risk factor for global mortality. In case you think being a couch potato can't hurt you, almost 15 million people worldwide die each year from a lack of activity—and children are at a huge risk to be among them. You may have heard of kids being diagnosed with Attention Deficit Disorder (ADD), an inability to stay focused on school work, conversations, or chores. Now doctors are diagnosing children with exercise deficit disorder (EDD) when they are not getting the recommended 60 minutes of "moderate-to-vigorous" exercise every day. Teaching your kids to be active (and eat right) can be more than just a fun way to bond with them—or to get them out of the house when you need a break. With inactivity leading to type 2 diabetes, hypertension, coronary disease, strokes, and obesity, keeping kids active can be a matter of life and death. The U.S. Centers for Disease Control estimates that about 400,000 people in the United States die each year due to poor diet and physical inactivity. According to a 2010 study, 5-10 percent of U.S. health-care spending is directly associated with treating potentially preventable negative health outcomes due to inactivity. With the U.S. projected to spend $3.5 trillion on health care in 2018, avoiding those costs would save $1.75-3.5 billion per year. A 2018 study on child exercise deficit disorder suggests reallocating at least some of those dollars to increase children's opportunities for physical activity—instead of using it to treat the health problems created by a lack of such activity. Not only would children's risk of obesity and all the diseases that come with it be decreased, children could also enjoy increased bone density, less depression, better motor skills, and improved emotional, social, and cognitive well-being. Unlike ADD, which is widely treated with drugs, there is no drug for EDD. The only treatment is to get up and move. 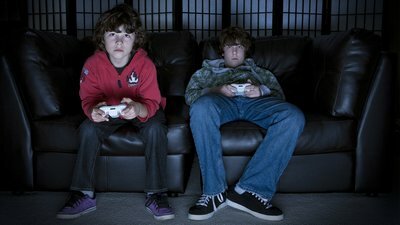 So, when you see your child curling up on the couch for a two-hour video game session or to binge watch "A Series of Unfortunate Events," give them the greatest gift possible: Get them up on their feet, get their heart rate going, and maybe even help them break a sweat. Be creative. Find ways to make it fun so they'll be eager to make being active an important part of their lives—and something they can pass on to their kids, too. Walker, G., Stracciolini, A., Faigenbaum, A. D., & Myer, G. D. (2018). Physical Inactivity in Youth: Can Exercise Deficit Disorder Alter the Way We View Preventative Care? ACSM's Health & Fitness Journal, 22(2), 42-46.